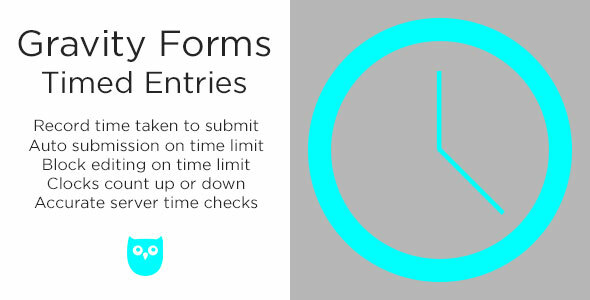 Time your Gravity Forms quiz/form entries and set time limits! Add time limits for quiz/form completion with auto submission or blocked editing on a timer and record quiz/form completion times. The plugin can optionally show the user timers which count up or down for the total entry time. If you have a quiz or form that needs a time limit or that you would like to know the amount of time it took to complete, this is the plugin for you! Entry timer fields can be visible to the user or hidden, and if a quiz/form time limit is set and the time limit is reached, you can either block further editing, or auto submit the quiz/form as is. –Entry Timer fields record the total amount of time taken to complete a quiz/form. -Quiz/Forms can have time limits set for entry time. -Quiz/Forms can be auto submitted on time limit expiration (read “Important Notes” below). -Quiz/Forms editing can be blocked on time limit expiration (read “Important Notes” below). -Entry timer fields can be hidden or visible to the user. -Entry timer fields can be excluded from the submited quiz/form data. -Timers count up or down. -Timers are backed by a custom server time check interval to avoid users cheating with system time changes. -Simple “System Check” to be sure your system meets plugin requirements. – Inline and/or tooltip documentation for every option and setting. -Setup instructions are on the plugin settings page and directly inline with plugin options and tooltips for users to be up and running in a couple minutes. Imprtant Notes: The “Block Editing” and “Auto Submit” functionality of this plugin are best suited and intended for single page ajax enabled quizes/forms with NO required fields where users cannot enter invalid data into fields that would block normal submission or could be malicious. However, the functionality of these options will work on multi page and non ajax enabled forms as well. The “Auto Submit” feature achieves submission by bypassing all required fields and field data validation and is intended for single page quizes/forms where there is no possible custom user input such as open text fields or text areas that could be invalid or malicious. The “Block Editing” feature does not bypass validation but is intended for the same quiz/form types where any already entered data could not potentially be invalid and prevent the user from submitting.